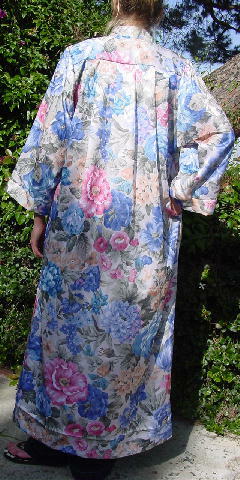 This vintage loungewear is 100% polyester and is Ariel by Peter Keyloun, and was made in the USA. The tag says size Small, but it fits like a one size fits all. There is a 23 3/4" long front zipper. It has 4 wide pleats extending downward from the back yoke and 4 in the front extending downward from the front yoke. There is an offwhite background with flowers and leaves in various shades of blue, pink, light cocoa, bone, light and medium olive, light gray, and honey. There are side seam slash pockets and a 1 1/2" wide mandarin collar. 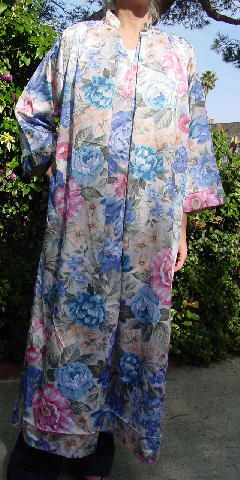 It's from a former larger size model. bottom hem side to side 31 1/2"